Madonna with the Long Neck is typical of Parmigianino's later work, which was defined by unusual spatial compositions and elongated figures. 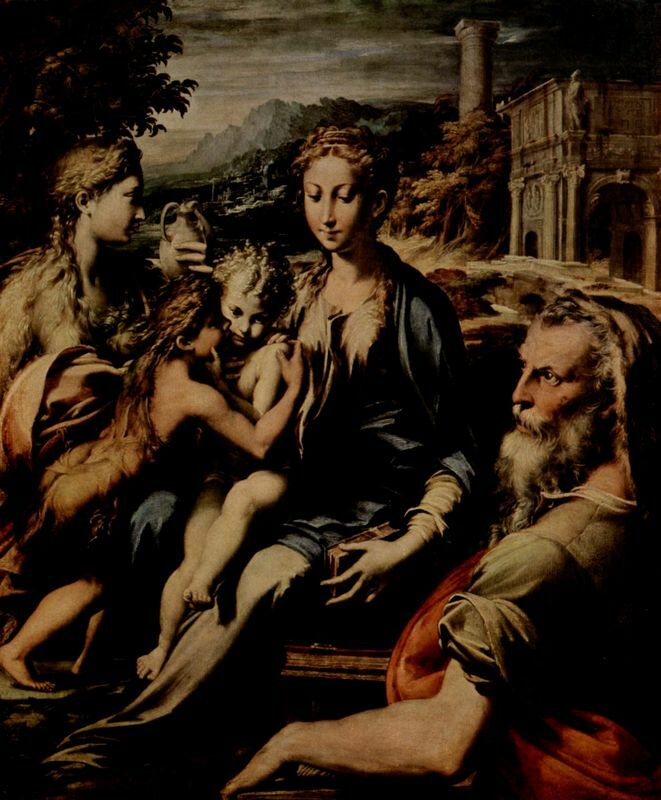 The painting is also known as Madonna and Child with Angels and St Jerome but earned the name Madonna with the Long Neck because of the curious length of the Madonna's swan-like neck. 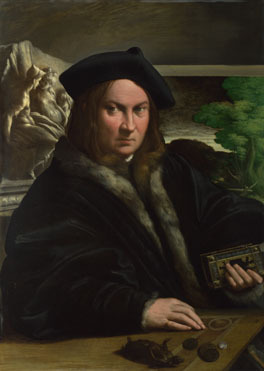 This painting is one of Parmigianino's more controversial works and has been analyzed by many critics. It shows the Madonna, seated on a high pedestal and clothed in beautiful robes, holding the baby Jesus on her lap. To the left of the picture are four angels crowded around the Madonna, looking admiringly on Christ. On the right are a row of marble columns and the disproportionally small figure of St. Jerome. 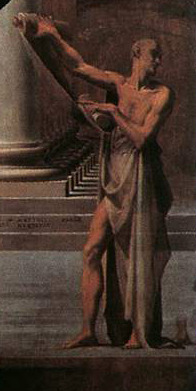 It was necessary for the painting to include the image of St Jerome because of the saint's connections with the worship of the Virgin Mary. The subject of this piece is derived from medieval hymns which compared the Virgin's neck to a great ivory tower or column. 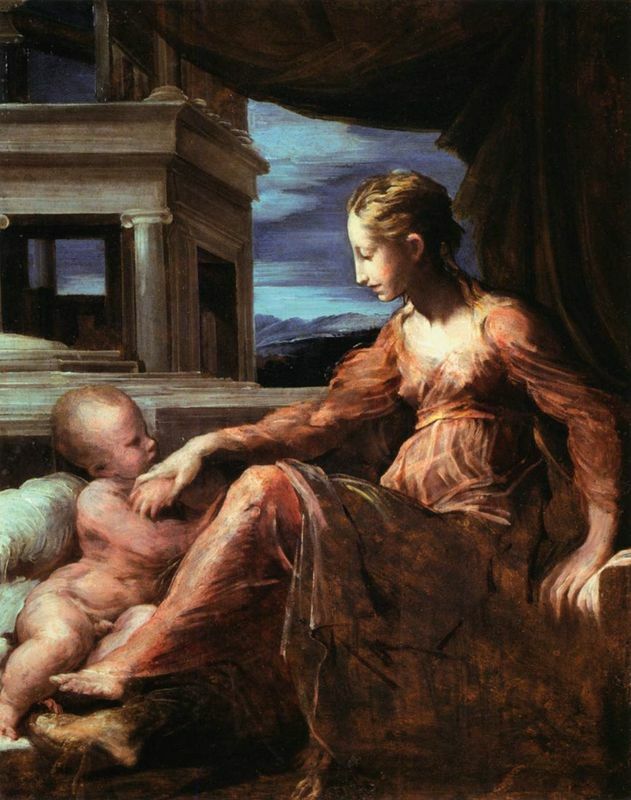 Therefore the exaggerated length of the Virgin's limbs and those of her son and the presence of columns in the background of the painting, are symbolic of the painting's religious value. Originally, this painting was commissioned by the noblewoman Elena Baiardi for her family chapel in the church of Santa Maria dei Servi in Parma. This was the principle work of Parmigianino's last period and he worked on it for six years but it was never completed because of the artist's death in 1540. Unlike the calm and peaceful Madonnas that Raphael painted, Parmigianino's painting gives more of a sense of abandon and movement. The Madonna's posture is relaxed, open and perhaps just a little carefree. Parmigianino studied and admired the grace and poise in Raphael's art, but he has remodeled the figures from the old master's work and turned them into almost unearthly creatures: their limbs, ivory marble skin, blithe attitude, all portray a different idea of ideal beauty. 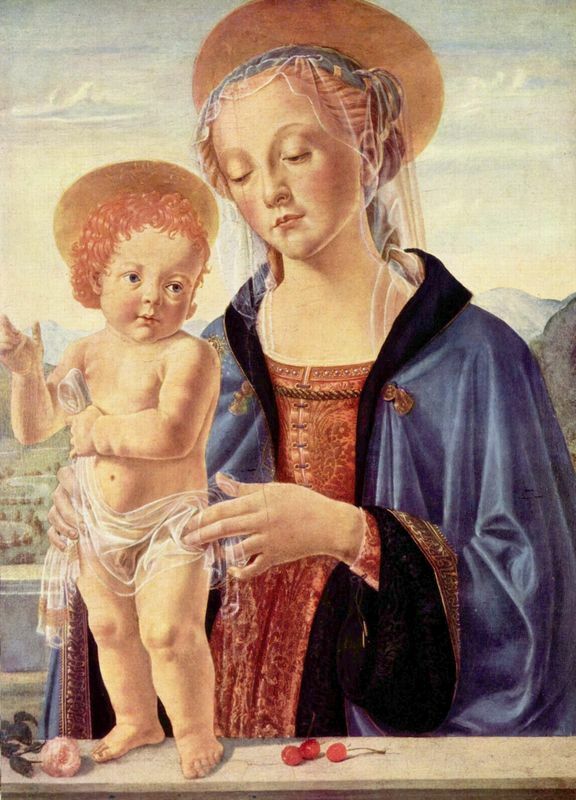 The Madonna does not have normal human proportions; her neck, shoulders and fingers have all been elongated to make her appear more elegant and graceful. Her hair is also elaborately curled and decorated with pearls to frame her beautiful face and complexion. The robes she is wearing are luxurious and flowing. 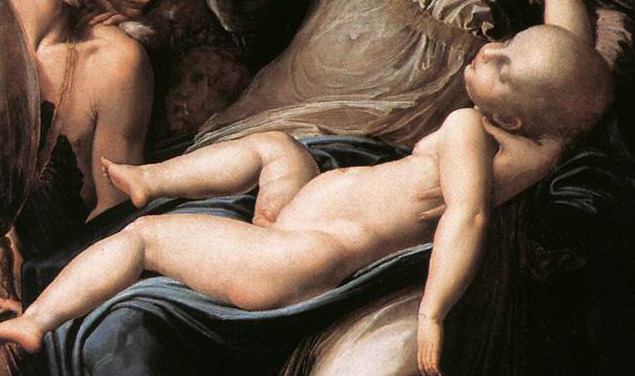 Parmigianino has stretched and lengthened bodily parts in the painting in a strange and impulsive way. The Angel's leg in the foreground is glossy and suggestive, whilst the prophet, holding up his scroll, looks emancipated and gaunt. 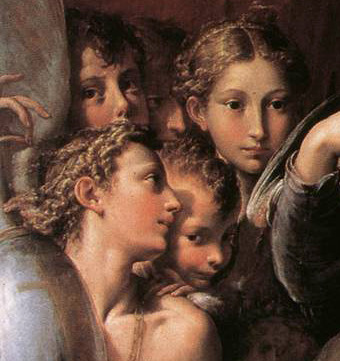 The lavish, inviting image of the Madonna, combined with crowd of Angels in various states of undress has led some critics to believe that Parmigianino was trying to eroticize the scene. 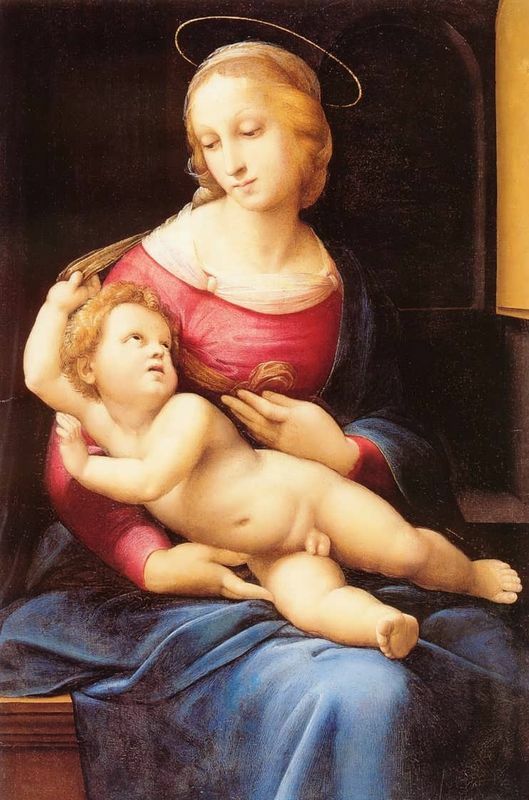 An oversized Christ child is splayed across the Madonna's lap. The way his arm is hanging freely down is also a pose suggestive of death, adding to the sense of ambiguity surrounding the painting. Instead of giving a sense of equilibrium and balance to his arrangement, Parmigianino has chosen to pack all the angels claustrophobically to the left of the Madonna. Yet, the space to the right of her is open, except for the tall figure of St Jerome who has been so reduced in size he only just about reaches the Madonna's knee. The viewer's eye is forced to restlessly move around the painting in order to take in the disproportions of the tiny St Jerome to the overbearingly large figure of the Madonna. Even the architecture surrounding the Madonna looks to be out of proportion, with the strange sized column which looks to have no base or supporting structures behind it. 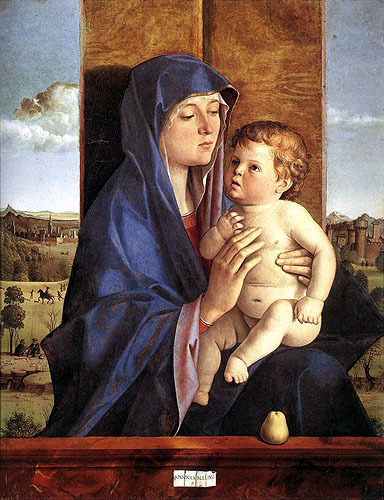 Depictions of the Madonna and child were a very popular art form during the Renaissance. It was common for the Virgin, with saints either side of her, to be painted onto altarpieces. 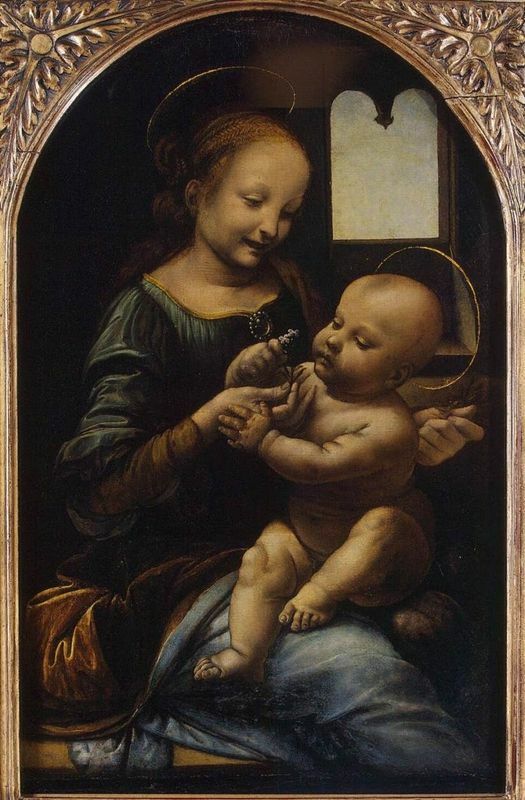 Viewers were supposed to seek piety through the Madonna's beauty and tenderness. Many have questioned the unorthodox method that Parmigianino used to set and create the scene in Madonna with the Long Neck. Many have found the painting to be offensive because of the way the artist has exaggerated and manipulated aspects in the sacred theme such as spatial distances and bodily proportions. 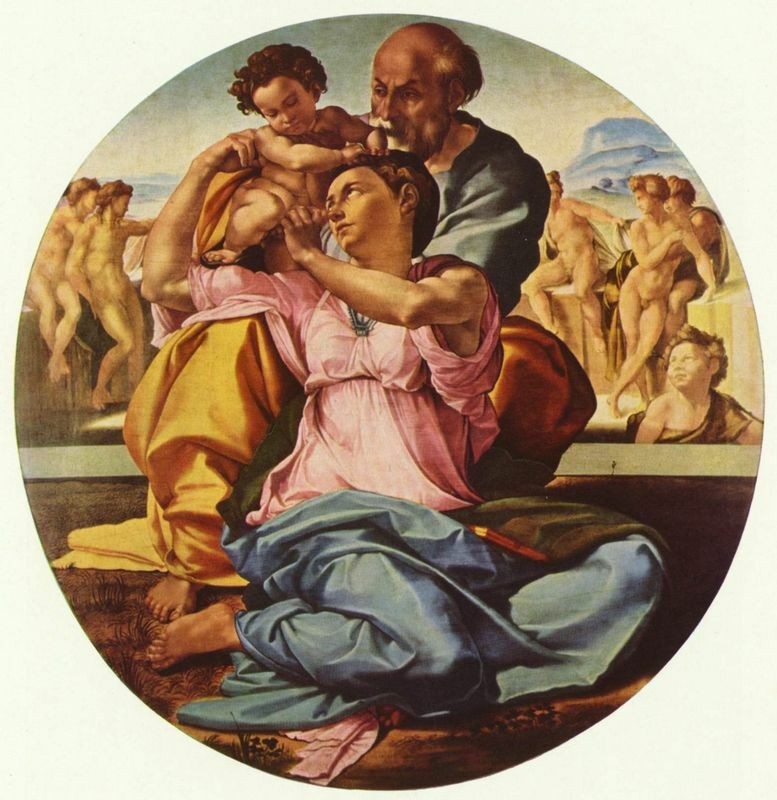 Compared to the ease and simplicity with which Raphael and other Renaissance artists had painted the ancient theme, Parmigianino's version is rather modern and controversial. His style is characterized by the lengthening of form, whether this is necks, limbs or shapes. Some of his artworks seem to be fixated by a sense of distortion, and as with many other mannerist artists his work exaggerates the ideal beauty depicted by Raphael and other eminent Renaissance artists. Often the colors used are vivid and give an impression of tension and unreal lighting. Parmigianino perhaps wanted to emphasize that he did not believe in conventional harmonies and that the classical sense of beauty was not the only artistic solution. He wanted to create something new and push the boundaries of how the theme had usually been portrayed by classical artists. It was this daring streak that paved the way for other bold artists to continue in the same vein and therefore it is no wonder that contemporary art critics christened Parmigianino the 'Prince of Mannerism'. Parmigianino did incorporate the grace of Raphael and the great masters into his paintings, but he also created some highly original work. As such he was always going to receive disapproval from those that disliked his ambiguous spatial compositions and elongated figures, especially in his religious work. Whether early critics dismissed or supported Parmigianino's work, it was inevitable that they would interpret it as reactionary and dramatic. The Mannerist movement was initially a reaction against Classism, and harmonious works of previous artists such Leonardo da Vinci, Michelangelo and Raphael. It was a style that was notable for its spatial incongruity and elongated forms. It played with the idea of artificial, rather than natural qualities within art. Mannerism developed around 1520 in either Florence or Rome and replaced the High Renaissance era. It lasted until around 1580 with the emergence of the Baroque style. 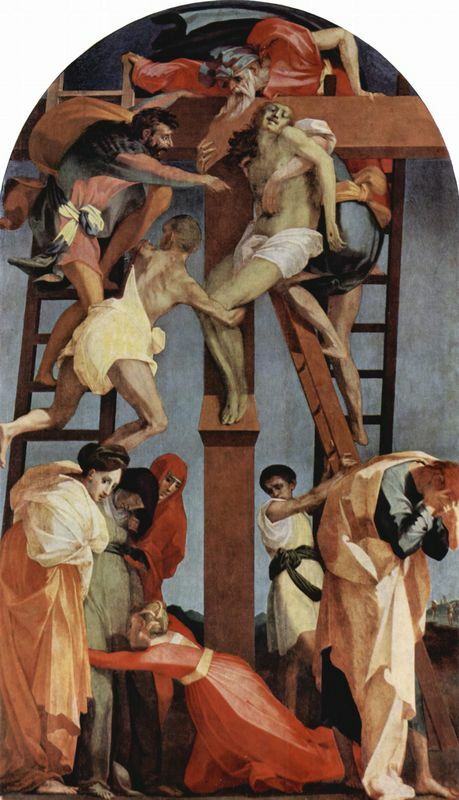 Early Mannerist painters include Andrea del Sarto, Jacopo Pontormo and Rosso Fiorento. 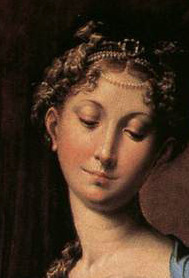 Parmigianino had a massive stylistic influence on Mannerism and sixteenth-century graphic art in general. He successfully managed to combine in his work the graceful and elegant style of the great masters with a new sense of movement and a striving for a sensuous beauty beyond nature. Many of his paintings contain within them mysterious ambiguities and conceal strains and tensions of the time. During his short career, Parmigianino completed a vast body of work, including small panels and large-scale frescoes, sacred and profane subjects, portraits, and drawings of scenes from everyday life and of erotica. He is also credited with inventing etching and was one of the first artists to engrave his own work, distributing it throughout Italy and northern Europe. To read more about Parmigianino please refer to the recommended reading list below.